B-50A-5BO 46-10 Lucky Lady II, the first-ever aircraft to fly around the world nonstop. 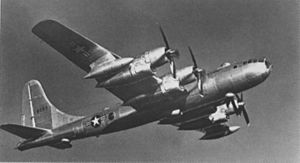 The Boeing B-50 Superfortress was a post-World War II revision of the wartime United States B-29 Superfortress with larger Pratt & Whitney R-4360 radial engines, a taller vertical stabilizer, and other improvements. Officially, the aircraft's new designation was justified by the changes incorporated into the revised aircraft, but according to Peter M. Bowers, a long-time Boeing employee and aircraft designer, and a well-known authority on Boeing aircraft, "the redesignation was an outright military ruse to win appropriations for the procurement of an aeroplane that by its designation appeared to be merely a later version of an existing model that was being canceled wholesale, with many existing examples being put into dead storage." Boeing built 371 of the various B-50 models and variants between 1947 and 1953, some serving until 1965. A reconnaissance variant, the RB-50B (a B-50B conversion) existed and played an important role in Cold War espionage. An aerial refueling tanker conversion designated KB-50 was used in the Vietnam War. In 1949, The Lucky Lady II, commanded by Captain James Gallagher, became the first airplane to circle the world nonstop. This was achieved by refueling the plane in flight. Although constructed in relatively small numbers, the B-50 was the last member of the B-29 family and was one of the last piston-engined bombers built. The B-50 was retired from its main role as atomic bomber in 1955. A number were converted into KB-50 tankers and lasted long enough to be deployed to Southeast Asia in support of tactical operations. B-50s were grounded and removed completely from inventory when wreckage of a KB-50 that broke up in flight in 1965 revealed corrosion problems in the fleet. No flying examples exist today, although several can be found in various air museums. ↑ 1.0 1.1 Knaack, Marcelle Size. 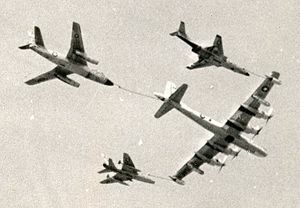 Post-World War II bombers, 1945-1973. Washington, DC: Office of Air Force History, 1988. ISBN 0-16-002260-6. It uses material from the Wikipedia article "Boeing B-50". This page was last edited on 1 April 2008, at 19:49.